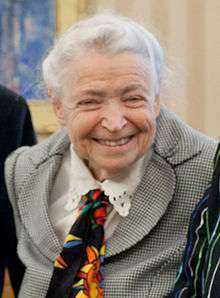 Mildred Dresselhaus (born Mildred Spiewak on November 11, 1930 in Brooklyn, New York), known as the "queen of carbon science", is the first female Institute Professor and professor emerita of physics and electrical engineering at the Massachusetts Institute of Technology. Dresselhaus has won numerous awards including the Presidential Medal of Freedom, the National Science Medal, the Enrico Fermi Award and the Vannevar Bush Award. She was born Mildred Spiewak on November 11, 1930 in Brooklyn. In 2000–2001, she was the director of the Office of Science at the U.S. Department of Energy. From 2003-2008, she was the chair of the governing board of the American Institute of Physics. She also has served as president of the American Physical Society, the first female president of the American Association for the Advancement of Science, and treasurer of the National Academy of Sciences. Dresselhaus has devoted a great deal of time to supporting efforts to promote increased participation of women in physics. President Barack Obama greets Dr. Mildred S. Dresselhaus, third from right, and Dr. Burton Richter, right, May 7, 2012. In 2012 Dresselhaus was co-recipient of the Enrico Fermi Award, along with Burton Richter. On May 31, 2012, Dresselhaus was awarded the Kavli Prize "for her pioneering contributions to the study of phonons, electron-phonon interactions, and thermal transport in nanostructures." Dresselhaus is particularly noted for her work on graphite, graphite intercalation compounds, fullerenes, carbon nanotubes, and low-dimensional thermoelectrics. Her group has made frequent use of electronic band structure, Raman scattering and the photophysics of carbon nanostructures. Dresselhaus' former students include such notable materials scientists as Deborah Chung and notable physicists as Nai-Chang Yeh, Greg Timp, Mansour Shayegan, James S. Speck, Lourdes Salamanca Riba, and Ahmet Erbil. There are several physical theories named after Dresselhaus. The Hicks-Dresselhaus Model (L. D. Hicks and Dresselhaus)  is the first basic model for low-dimensional thermoelectrics, which initiated the whole band field. The SFDD model (Riichiro Saito, Mitsutaka Fujita, Gene Dresselhaus, and Mildred Dresselhaus)  first predicted the band structures of carbon nanotubes. The Tang-Dresselhaus Theory (Shuang Tang and Dresselhaus)  has developed a methodology for studying narrow-band low dimensional materials systems, and is also the first theory on how to construct various Dirac-cone materials, including single-Dirac-cone materials, bi-Dirac-cone materials, tri-Dirac-cone materials, quasi-Dirac-cone materials, semi-Dirac-cone materials and exact-Dirac-cone materials. The Rashba-Dresselhaus Effect refers to the spin-orbital interaction effect modeled by Gene Dresselhaus, Mildred Dresselhaus's husband. She is married to Gene Dresselhaus, a well-known theorist, and has four children and several grandchildren. Dresselhaus, M. S.; et.al. "Analysis of Picosecond Pulsed Laser Melted Graphite", Massachusetts Institute of Technology, Harvard University, Los Alamos National Laboratory, United States Department of Energy, (December 1986). Dresselhaus, M. S.; et.al. "The Transport Properties of Activated Carbon Fibers", Lawrence Livermore National Laboratory, United States Department of Energy, (July 1990). Dresselhaus, M. S.; et.al. "Photoconductivity of Activated Carbon Fibers", Lawrence Livermore National Laboratory, United States Department of Energy, (August 1990). Dresselhaus, M. S.; et.al. "Synthesis and Evaluation of Single Layer, Bilayer, and Multilayer Thermoelectric Thin Films", Lawrence Livermore National Laboratory, United States Department of Energy, (January 20, 1995). M. S. Dresselhaus & P. C. Eklund (2000). "Phonons in carbon nanotubes" (PDF). Advances in Physics. 49 (6): 705. Bibcode:2000AdPhy..49..705D. doi:10.1080/000187300413184. M. S. Dresselhaus; G. Samsonidze; S. G. Chou; G. Dresselhaus; J. Jiang; R. Saito & A. Jorio. "Recent Advances in Carbon Nanotube Photo-physics" (PDF). M. S. Dresselhaus & G. Dresselhaus (2002). "Intercalation Compounds of Graphite" (PDF). Advances in Physics. 51 (1): 1. Bibcode:2002AdPhy..51....1D. doi:10.1080/00018730110113644. M. S. Dresselhaus (2004). "Big Opportunities for Small Objects" (PDF). Materials Today Magazine. 5 (11): 48. doi:10.1016/S1369-7021(02)01164-1. M. S. Dresselhaus, G. Dresselhaus and A. Jorio (2004). "Unusual Properties and Structures of Carbon Nanotubes" (PDF). Annual Review of Materials Research. 34 (1): 247. Bibcode:2004AnRMS..34..247D. doi:10.1146/annurev.matsci.34.040203.114607. M. S. Dresselhaus & H. Dai (2004). "Carbon Nanotubes: Continued Innovations and Challenges". MRS Bulletin. 29: 237. doi:10.1557/mrs2004.74. J. Heremans & M. S. Dresselhaus (2005). "Low Dimensional Thermoelectricity" (PDF). CRC Handbook - Molecular and Nano-electronics: Concepts, Challenges, and Designs. M. S. Dresselhaus, R. Saito and A. Jorio (2004). "Semiconducting Carbon Nanotubes" (PDF). Proceedings of ICPS-27. M. S. Dresselhaus (2004). "Nanotubes: a step in synthesis". Nature Materials. 3 (10): 665–6. Bibcode:2004NatMa...3..665D. doi:10.1038/nmat1232. PMID 15467687. M. S. Dresselhaus (2004). "Applied Physics: Nanotube Antennas". Nature Materials. 432 (7020): 959–60. Bibcode:2004Natur.432..959D. doi:10.1038/432959a. PMID 15616541. H. Son; Y. Hori; S. G. Chou; D. Nezich; G. Samsonidze; E. Barros; G. Dresselhaus; M. S. Dresselhaus (2004). "Environment Effects on the Raman Spectra of Individual Single-wall Carbon Nanotubes: Suspended and Grown on Polycrystalline Silicon" (PDF). Applied Physics Letters. 85 (20): 4744. Bibcode:2004ApPhL..85.4744S. doi:10.1063/1.1818739. Dresselhaus, M. S.; et.al. "Iron-Doped Carbon Aerogels: Novel Porous Substrates for Direct Growth of Carbon Nanotubes", Lawrence Livermore National Laboratory, United States Department of Energy, (February 20, 2007). 1 2 Mildred Dresselhaus was elected in 1974 as a member of National Academy of Engineering in Electronics, Communication & Information Systems Engineering and Materials Engineering for contributions to the experimental studies of metals and semimetals, and to education. 1 2 Queen of Carbon Science, U.S. News & World Report. By Marlene Cimons, National Science Foundation. 27 July 2012. Retrieved 14 August 2012. ↑ Natalie Angier (July 2, 2012). "Carbon Catalyst for Half a Century". New York Times. Retrieved 2012-07-03. ↑ "80th Birthday Celebration for Millie Dresselhaus". web.mit.edu. Retrieved 2015-04-18. ↑ "SENATE CONFIRMS DRESSELHAUS AS DIRECTOR OF DOE OFFICE OF SCIENCE - Republican News - U.S. Senate Committee on Energy and Natural Resources". www.energy.senate.gov. Retrieved 2015-04-18. ↑ "NSF and NSB Pay Tribute to Three Top American Scientists and Public Service Awardees at Annual Ceremony- All Images - US National Science Foundation (NSF) - US National Science Foundation (NSF)". www.nsf.gov. Retrieved 2015-04-18. ↑ "Dresselhaus Wins Medal of Science" (Press release). MIT News Office. November 14, 1990. Retrieved 2007-05-30. ↑ "National Science Foundation - The President's National Medal of Science". Retrieved 24 November 2014. ↑ "The Heinz Awards, Mildred Dresselhaus profile". ↑ "President Obama Names Scientists Mildred Dresselhaus and Burton Richter as the Enrico Fermi Award Winners". ↑ 2012 Kavli Prizes/Mildred S. Dresselhaus/2012 Nanoscience Citation, Kavli Foundation. Retrieved 14 August 2012. ↑ "Obama awards Presidential Medal of Freedom to 18". San Francisco Chronicle. Retrieved 24 November 2014. ↑ "Effect of quantum-well structures on the thermoelectric figure of merit". ↑ "Electronic structure of graphene tubules based on C60". ↑ "Thin films of bismuth-antimony have potential for new semiconductor chips, thermoelectric devices". MIT News Office. ↑ "Doing the right things". ETH Zurich. November 21, 2015. Retrieved November 23, 2015. ↑ "Spotlight | National Inventors Hall of Fame". Invent.org. 2013-11-21. Retrieved 2016-05-29. ↑ "President Obama Announces the Presidential Medal of Freedom Recipients". The White House. November 10, 2014. Retrieved November 11, 2014. ↑ "PolyU to honour five distinguished personalities at 19th Congregation". The Hong Kong Polytechnic University. September 23, 2013. Retrieved March 24, 2015.